Our Former President Dr. Radha krishnan’s birth day is celebrated as Teachers day as per his wish. It’s his strong belief that teachers played the crucial role in the nation building while igniting the young minds to broaden their outlook and get in proved their morale and thus moulding them to be the asset of the nation; Teachers empower the students to be the heralds on the earth. In support of his view, the nation celebrates ‘The Teachers’ Day on 5th September, being it his birthday. As per Xavierites, it’s the long awaited day, to pay a touching floral tribute to their teachers, for the marvels of beauty they bear. 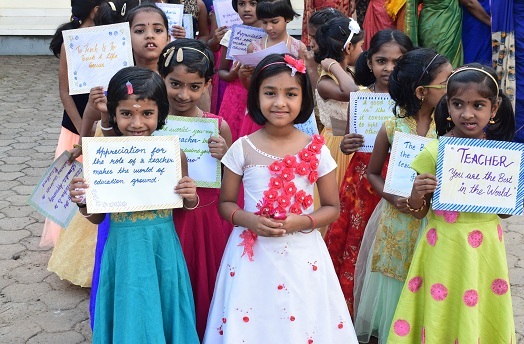 All students being in a jovial mood rush towards them in colored emotions and with verbal expressions, to wish them good health, longevity and happiness. The Xavieran students feel highly indebted to teachers for their valuable service rendered to. The day beckons all young souls here, to the reflection “You have touched us and we’ve grown we’re blessed because of you”.